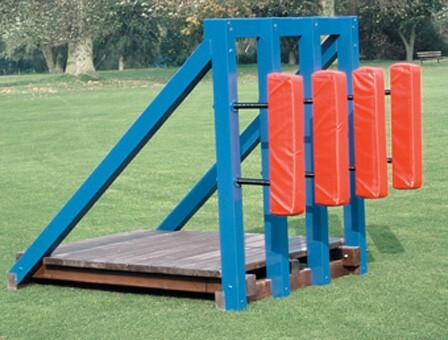 Sturdy basic scrum machine with 4 x spring loaded pads covered with foam and weather resistant PVC bolted to 4 timber uprights. The frame is finished in blue gloss. The softwood floor is treated with preservative. There are skids on the underside of the floor. Distance between the pads is 254mm (10"). NB: This scrum should never be used without supervision of a qualified coach. PVC Scrum Cover is also available.